With more than 28 years of restaurant and hospitality experience, John Metz knows what it takes to create, run and maintain a successful restaurant company and has done just that for the past 18 years with his many culinary ventures in the Atlanta area. As Executive chef and co-owner of Marlow’s Tavern, Aqua Blue, and Hi Life Kitchen and Cocktails, John is thrilling residents in the Atlanta area with cuisine that inspires and entraps even the hardest to please. 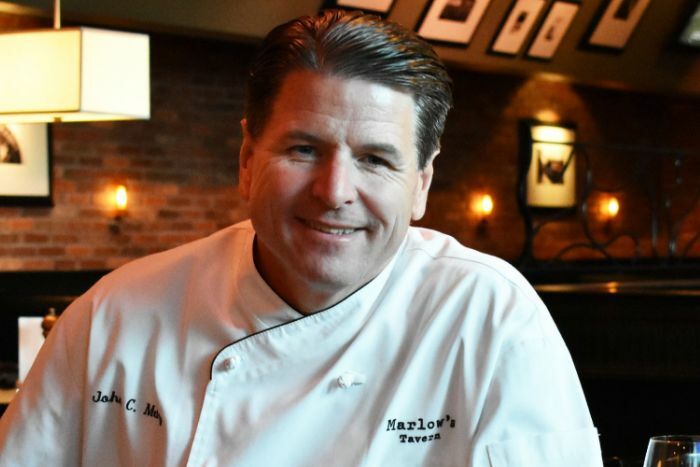 Metz brings this knowledge and flavor to the menu of Marlow’s Tavern. Trained by the best he began his education at one of the top learning institutions in the country, The Pennsylvania State University, where he received his bachelors degree in Hotel & Restaurant Management. He then went on to pursue his culinary education by obtaining a degree from the distinguished Culinary Institute of America where he graduated at the top of his class. Metz began his laudable career at some of the finest restaurants in New York City including The 21 Club, Tribeca Grill, Park Avenue Café, Montrachet and Della Famina’s in East Hampton. In addition, Metz served as executive chef and executive director of research and development for Carlson Restaurants Worldwide, the franchisor for T.G.I. Friday’s, where he helped develop the brands of Italianni’s, Front Row Sports Grill and Samba Room. In addition he headed up the research and development for Carlson’s international restaurant and business division opening restaurants in 10 countries around the world. In 1997, Metz and partner Thomas DiGiorgio started their business with the creation of Hi Life kitchen & cocktails in Norcross. “Hi Life put our company on the map at a time when the trends we started there were not as developed as they are today,” said Metz. Metz & DiGiorgio co-founded and operate an upscale contract foodservice company, Sterling Spoon Fresh Culinary Management, which specializes in on-site restaurant management. Sterling Spoon offers a unique corporate dining alternative to the on-premise business cafeterias of the past by creating a full service restaurant environment inside each of the cafes it operates, adding a chef-driven culinary flair to ensure the highest quality flavor and presentation in the Atlanta area. Metz is very involved in the industry and communities in which he operates his businesses. He serves on numerous local and national boards as well as many local charity organizations. He is on the National Restaurant Association’s and Georgia Restaurant Association’s Boards of Directors, The Atlanta Visitors and Convention Bureau’s Board and was appointed as Vice Chairman 2005 for the Distinguished Restaurants of North America (DiRoNA). Where he became the 2007 and 2008 Chairman of the Board for DiRoNA. In addition, he is actively involved with the Special Olympics of Georgia and Share our Strength organizations. Sterling Hospitality has raised hundreds of thousands of dollars for these and other local community organizations.